I think there are a lot of people who wonder if they can use alternative setups with their Hot Pot Cooker reflector panel, and I am one of them. Today's experiment involved using a cobalt blue bowl that I own, which fit within a clear bowl (not the one that ships with the HPC). The lid from the Hot Pot Cooker however, fit over (not within) the lip of the clear bowl, and formed a pretty good seal. Normally the lid fits within the outer lip of the Hot Pot Cooker setup. First, I timed the original HPC setup and found that it went from 150F to 225F in 15 minutes. 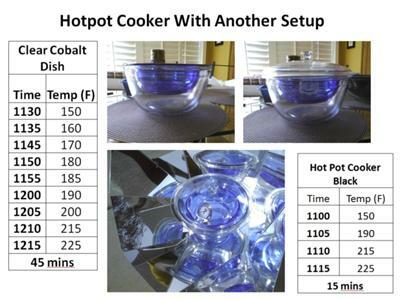 After letting the oven thermometer cool below 150F, I placed it in the alternative cobalt bowl setup. When it hit 150F, the timer started. Today we had light clouds during both test time periods, so I would expect both times to be lower in full sun, but surprisingly the cobalt translucent bowl saw the temperature reach 225F in 45 minutes. Obviously, black steel works best, but it was good to see how well a substitute performed. You are right, there are many who wonder and ask whether they can use a different "setup", or cookware. There are some good and serviceable variations, but in the end the steel pot that comes with it is the most effective, at least I feel so.